As the trends of the results of assembly elections started coming in victory celebrations started across the nation. 11 March 2017 became a historic day when a massive change swept the nation. This was the day when the results of keenly contested assembly elections were declared. In Uttar Pradesh and Uttarakhand the results crossed all imaginations. In Manipur BJP emerged from nowhere to form government with the support of other parties. In a hung assembly in Goa, BJP immediately emerged the most preferred choice for smaller parties and Manohar Parriker was sworn in as chief minister. Congress won the Punjab elections. Out of five states which went for elections, BJP formed government in four. It was huge mandate in favour of BJP. The people in UP and Uttarakhand gave mandates which was even higher than three-fourth majority decimating the opposition to irreparable extent. Political observers were surprised by Manipur result where BJP formed the government expanding its presence in the northeast. No one will deny the fact that the victory is a mandate for politics of performance and development. The Indian people are writing obituary to the caste, religion, dynasty and family based politics. The people are punishing corruption, misrule and non-performance. In the changed scenario BJP led by Prime Minister Narendra Modi and National President Amit Shah has become new hope for the nation. While the political observers will continue to debate and discuss the implications of these results refusal to accept the new reality will further erode the credibility of Marxist-Nehruvian brand of intelligentsia. Their failure to see the limitations of divisive ‘caste-communa-regional’ agenda in the garb of a particular ‘Secularist-Marxist’ paradigm in Indian politics has almost led the Congress and its allies to imminent decimation. The insistence of this particular brand of ‘intellectuals’ to see India through the borrowed ideas of Colonial-Marxist understanding viewing it as conglomeration of mutually exclusive entities desperate to fell apart at a single stroke has made them grossly misjudge the national reality. They failed to accept India as a nation since ancient times and its people standing united reinforcing the idea of India from time to time. This basic flaw in their understanding is making them more irrelevant academically and professionally in the context of emerging political realities. BJP from the time of Jansangh always believed India as a nation rooted in its ancient past and the path ahead for the India passes through politics of development, good governance and performance. While voting overwhelmingly to BJP the people have given message that they are not divided in castes and religion but they are for national cause, development, good governance, performance and nationalism. The message is that the people have immense faith in democracy, nationalism and they are aspiring for a new India. The massive mandate has reposed immense responsibilities on BJP. The responsibilities are manifold and with a mandate to not only for changing the system, its functioning, work culture but to change the entire perception about India, its society, culture and its aspirations. 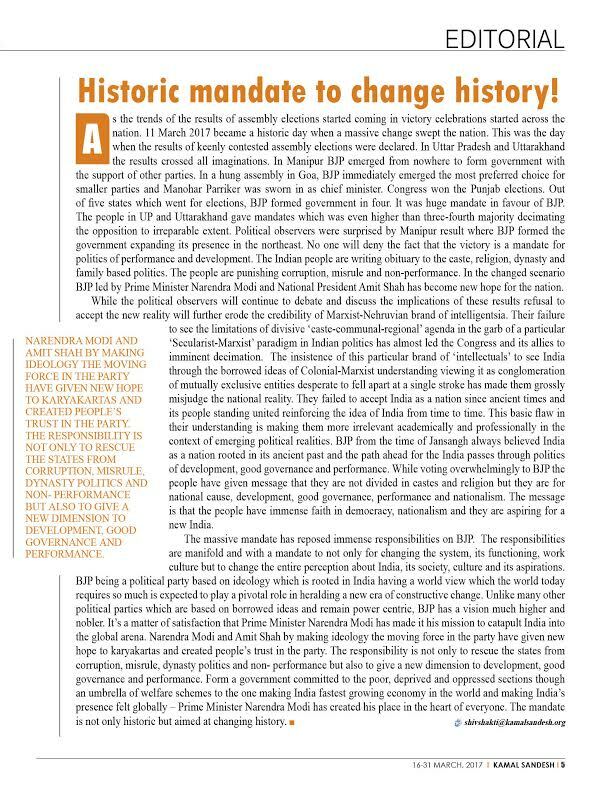 BJP being a political party based on ideology which is rooted in India having a world view which the world today requires so much is expected to play a pivotal role in heralding a new era of constructive change. Unlike many other political parties which are based on borrowed ideas and remain power centric, BJP has a vision much higher and nobler. It’s a matter of satisfaction that Prime Minister Narendra Modi has made it his mission to catapult India into the global arena. 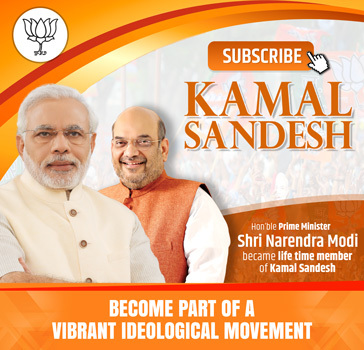 Narendra Modi and Amit Shah by making ideology the moving force in the party have given new hope to karyakartas and created people’s trust in the party. The responsibility is not only to rescue the states from corruption, misrule, dynasty politics and non- performance but also to give a new dimension to development, good governance and performance. Form a government committed to the poor, deprived and oppressed sections though an umbrella of welfare schemes to the one making India fastest growing economy in the world and making India’s presence felt globally – Prime Minister Narendra Modi has created his place in the heart of everyone. The mandate is not only historic but aimed at changing history.